After a year of campaigning James Graham, Marquis of Montrose achieved his final and greatest victory when he defeated the last Covenanter army in Scotland at the Battle of Kilsyth (1645). With the country back under Royalist control, it briefly offered Charles I a glimmer of hope that the civil war may yet be won. In August 1643 the Covenanter led Committee of Estates, which formed the Government of Scotland, joined forces with the English Parliament and declared war on King Charles I. A large Scottish army crossed the border in January 1644 under the command of Alexander Leslie, Earl of Leven and played a critical role in the war in the north including achieving a decisive victory at the Battle of Marston Moor (1644). In response the King appointed James Graham, Marquis of Montrose as Captain General in Scotland tasked with fighting the Covenanters in their home territory and causing the withdrawal of their forces from England. Graham successfully exploited the widespread distrust amongst the Highlanders of a key Covenanter - Archibald Campbell, Marquis of Argyll - enabling him to assemble a fledgling force. At the Battle of Tippermuir (1 September 1644) he captured stocks of weapons and gunpowder facilitating his assault on Aberdeen later the same month. He went on the offensive against Campbell, who was one of the foremost Covenanters in the Committee of Estates, surprising and defeating his forces at the Second Battle of Inverlochy in February 1645 following an incredible advance over the Ben Nevis mountain range. Over the subsequent months Graham's force increased in numbers as Highland Clans started joining him and he was also augmented with Irish troops under General Alasdair MacColla. He occupied Aberdeen and from there launched attacks on Brechin and Dundee. A Covenanter army, under Major-General Sir John Hurry, finally caught up with Graham in May 1645 but was decisively defeated at the Battle of Auldearn. Graham was now being seen as a significant problem and another Covenanter army, under the Command of Lieutenant General William Baillie, was sent to stop him. However, Baillie's force was undermined by the Committee of Estates who were concerned by the success of Graham and chose to split the surviving army into two in order to avoid the risk of a decisive defeat. Crucially they did not require that the new force, under Lord Lindsay, operated in conjunction with the existing army. Baillie found himself in an unenviable position and attempted to evade Graham who pursued him around Moray and Aberdeenshire. He was finally caught in July 1645 where his force was defeated at the Battle of Alford. Baillie immediately offered his resignation to the Committee of Estates and whilst it was accepted, he was obliged to continue in post until his replacement, Major-General Monro, arrived from Ireland. Nevertheless, the Committee had lost faith in him and now insisted his decisions were subject to review by a deputation. Given many of those appointed had already been defeated by Graham - including Campbell, Balcarres and Balfour - it is tempting to suggest this was probably an intense irritation to the Covenanter commander and it certainly undermined his ability to command the army. Having defeated the Covenanter army in the north, Graham now advanced on central Scotland proceeding down the east coast via Dundee, Perth and Stirling. Baillie however was reinforced with new troops from Fife, the borders and south-west Scotland. By the end of July 1645 he had almost 5,000 men under his Command forcing Graham to divert to Dunkeld to evade the regenerated Covenanter army. But by early August Graham himself was reinforced when Alasdair MacColla rejoined his army after having departed in May to recruit more men from the Highlands and Islands. Lord Aboyne also embarked on a recruitment drive bringing more men including a large cavalry contingent from the Gordon and Ogilvy clans. Graham was able to take the offensive again and, aware that Covenanter reinforcements were being raised in the Glasgow region by William Hamilton, Earl of Lanark, he sought to engage Baillie's force for what he hoped would be the final, decisive battle of the campaign. By contract Baillie was keen to avoid a fight until reinforced. He was overruled by other voices in his supervising delegation - most notably Archibald Campbell, Marquis of Argyll. Accordingly the army marched south after Graham. They proceeded from Stirling along the line of the A872/A803, a route the skirts round the Campsie Fells, arriving at Kilsyth on the morning of 15 August 1645. The Royalist forces had been greatly enhanced by the recruitment efforts of MacColla and Aboyne. The former had successfully raised over 1,400 men drawn predominantly from Clan Ranald and the MacLeans of Duart (from Mull). 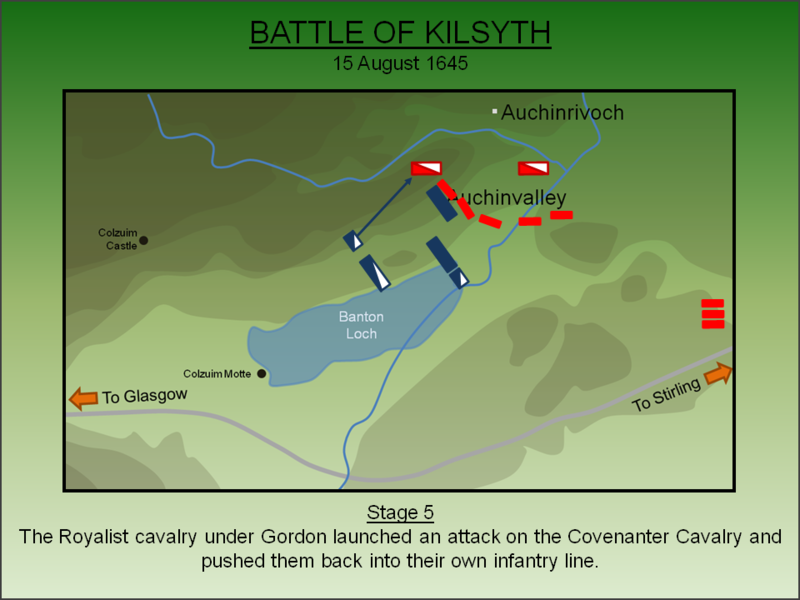 Aboyne meanwhile had recruited a further 800 infantry and significant numbers of cavalry from his kinsmen, the Gordons. All these men joined with MacColla's Irish detachment which meant Graham now commanded in excess of 3,500 men. Crucially he commanded a large (relative to the Covenanters) force of cavalry which he split into two small forces, under Colonel Nathaniel Gordon and Lord James Aboyne, along with a main Reserve under Lord James Ogilvy. By the time of the battle the Covenanter army, whilst still larger than the Royalist force, was not excessively so and probably numbered in the region of 4,000 troops. The infantry was configured into five Regiments consisting of one raised from Clan Campbell by the Marquis of Argyll, two others recruited by the Earls of Crawford and Lauderdale plus a further two under Colonel Robert Home and Colonel Kennedy. Home's Regiment seems to have been the largest. There were also three Regiments of Fife Levies although these individuals lacked military training. Two Regiments of cavalry had also been mustered - drawn from the remnants that survived Alford - and were under the Command of Lord Alexander Balcarres and Colonel Harie Barclay. The battle was fought on 15 August 1645 in terrain that consisted of walled fields, ditches and a number of small hamlets. The substantial changes to the battlefield - including the creation of Banton Loch reservoir in 1773, the quarrying activities, modern drainage and the development of a settlement at Banton - makes precise placement of the battle impossible without further archaeological investigation. Accordingly the narrative below, derived from the primary and secondary sources, must be treated with care. Whilst the sequence of actions conforms to the information available, the placing within the landscape is an estimation. Graham initially deployed on high ground overlooking the main road probably in the vicinity of the western portion of Banton Loch. 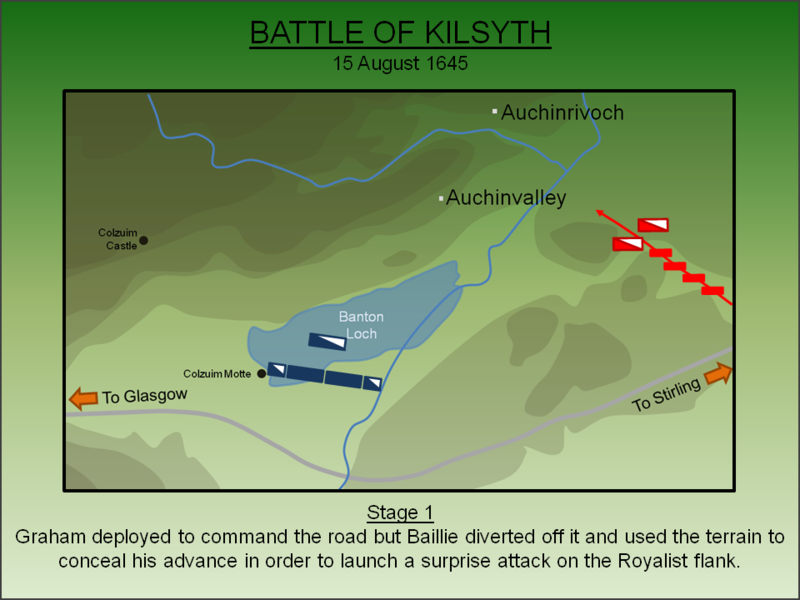 It is possible he intended to launch an ambush of Baillie's force but the Covenanter, wary of the wily Royalist commander, diverted his men off the road planning to attack Graham on his flank. He advanced his men in a column using the reverse slope of an adjacent hill to conceal his advance. Baillie's attempt to attack Graham on his flank was frustrated by the terrain which proved impassable. The Advisory Committee now instructed Baillie to seize the high ground overlooking the Royalist position perhaps in vicinity of Auchinrivoch. Baillie protested on the grounds this exposed his men to a risk of the Royalists attacking them on the march but he was overruled. 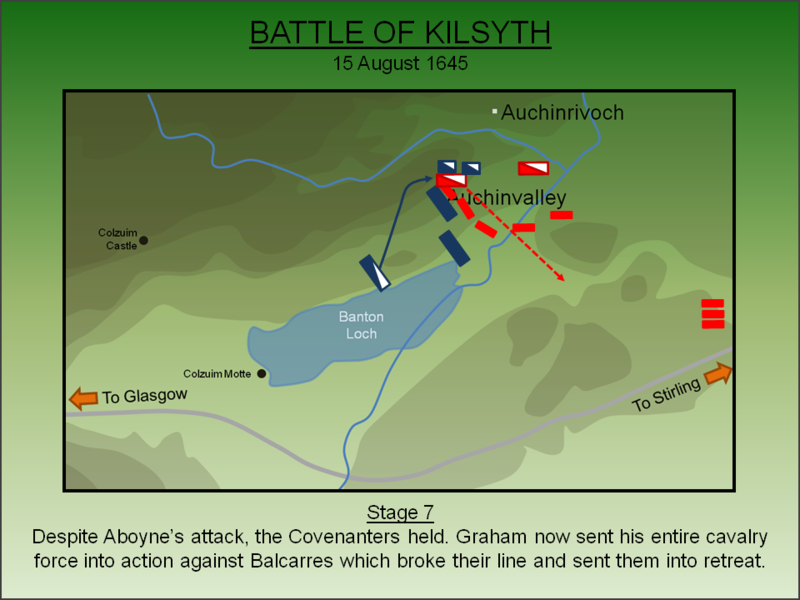 Although the movements of the bulk of the Covenanter army were obscured, Graham suspected what was happening and swung his army around to parallel Baillie's line of advance. Graham sent forward a detachment of Maclean's to occupy the enclosures around Auchinvalley. 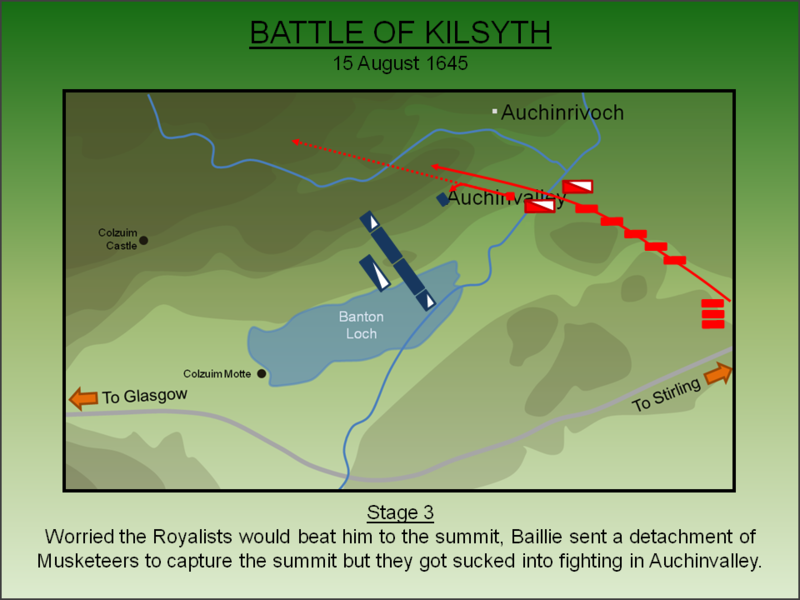 Worried that the Royalists would identify his intention to capture Auchinrivoch, Baillie sent forward Major Haldane with a force of musketeers to seize the summit. However, as they passed the enclosures at Auchinvalley, they got sucked into a protracted fire fight with the Highlanders. It is possible Haldane was unaware the area was occupied or perhaps he felt he could not leave this threat to his rear. Either way he got distracted from the advance towards north. MacColla, leading a detachment of MacDonalds, rushed to the aid of the troops in Auchinvalley. This prompted Home's Regiment - who had been specifically ordered by Baillie to ignore the fighting and press on towards the summit - to divert and launch an attack of their own in attempt to relieve the pressure on Haldane. The fighting turned into a bitter stalemate with the Highlanders, who were most effective when able to charge unhindered, restricted by the narrow enclosures. Around half the Covenanter infantry was now engaged but along a narrow frontage and the remainder were constrained by the terrain and not in a position to engage. Baillie's command and control, so blatantly ignored by his largest Regiment, had seemingly broken down. 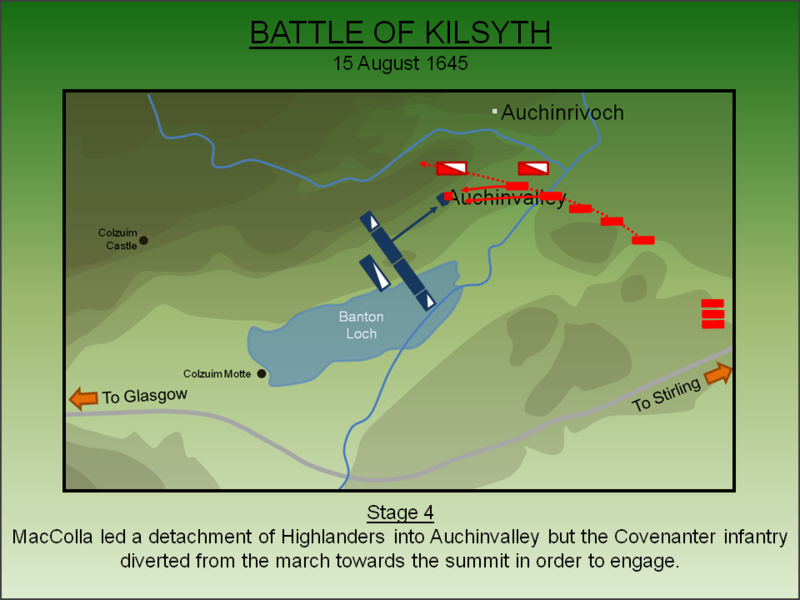 As the Covenanter line continued to advance, the cavalry under Balcarres sought to take the original objective - the summit at Auchinrivoch. However, his men had become strung out by the difficult terrain and the Gordon cavalry launched a spirited attack against them despite being outnumbered. Balcarres was initially pushed back into Home's infantry but their supporting fire checked the Royalist attack and threatened to envelope the Gordons. Aboyne, seeing his kinsfolk in trouble, charged to their support crossing the entire battlefield under heavy fire. Whilst his attack saved the Gordons, the Covenanter line still held. 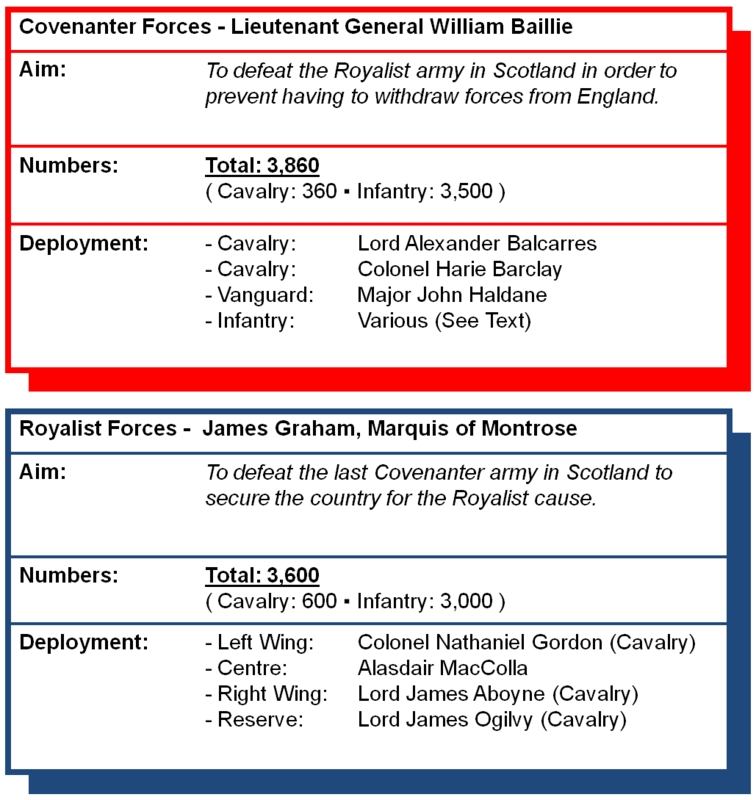 Seeing the Gordons and Aboyne in trouble, Graham sent Ogilvy into the fray with the bulk of the Royalist cavalry. This action broke the Balcarres cavalry who retreated downhill past their own infantry. The fleeing Covenanter cavalry spread panic amongst the Covenanter infantry as well as exposing their right flank to the full weight of the amassed Royalist cavalry. Many of the Covenanter troops did not wait for the inevitable attack and started to flee. Soon the entire force was in full retreat as the men fled back towards the safety of Stirling Castle. They were pursued with vigour with the Highlanders in particular keen to inflict a high blood price given a massacre of camp followers at Methven a few weeks earlier. Several of the Covenanter Regiments - including the Fife levies - had not been engaged and may have retreated in good order. Kilsyth made Graham master of all Scotland enabling him to summon a Parliament in Glasgow which would have met in October 1645. It was not to be, however, for Graham's control was merely a mirage. On the one hand his army was starting to disintegrate for his Highlanders were interested in plunder rather than consolidation and winning 'hearts and minds'. Secondly his success had achieved the King's original aim of forcing the Scottish army in England to be recalled. A large battle-hardened Covenanter army, under Major General Sir David Leslie, was now advancing intent on destroying Graham. Had this happened months earlier it could have been a game changer but, with the Royalist cause in England having been decisively defeated at Naseby in June 1645 and Rowton Heath in September 1645, it was simply too late to make a difference. In September 1645 Leslie cornered Graham in the Scottish Borders and at the Battle of Philiphaugh this most successful of Royalist Generals was finally defeated. Foard, G (2005). Kilsyth 1645. The Battlefields Trust. Lancaster, J.H.D (2016). 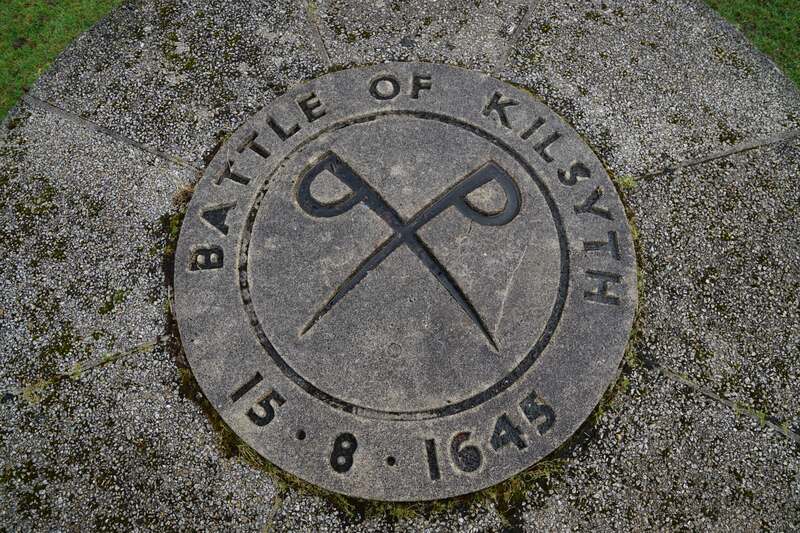 Kilsyth: Battlefield visit notes and observations. CastlesFortsBattles.co.uk. Ordnance Survey (2015). Kilsyth. 1:1250. Southampton. Reid, S (1989). 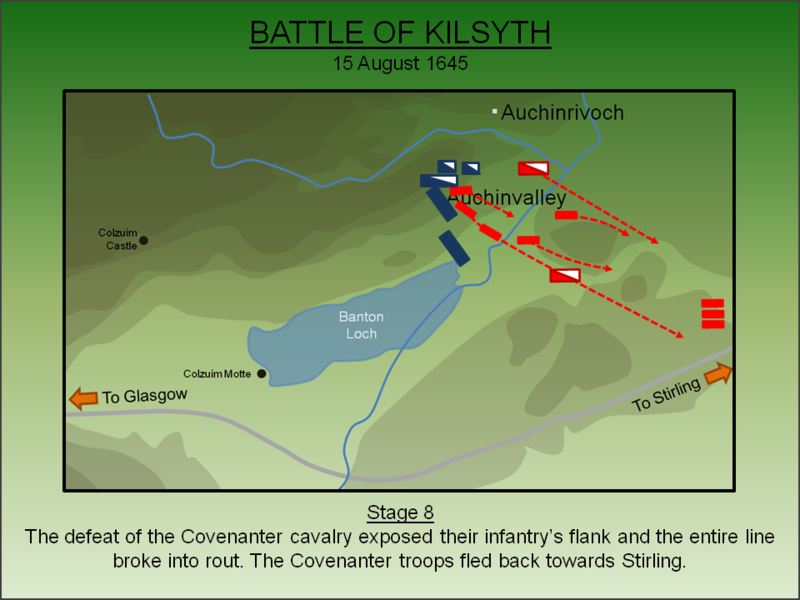 The Battle of Kilsyth, 1645, English Civil Wargames. Reid, S (2004). Battles of the Scottish Lowlands, Battlefield Britain. Pen and Sword, Barnsley. Seymour, W (1997). Battles in Britain 1066-1746. Ware. 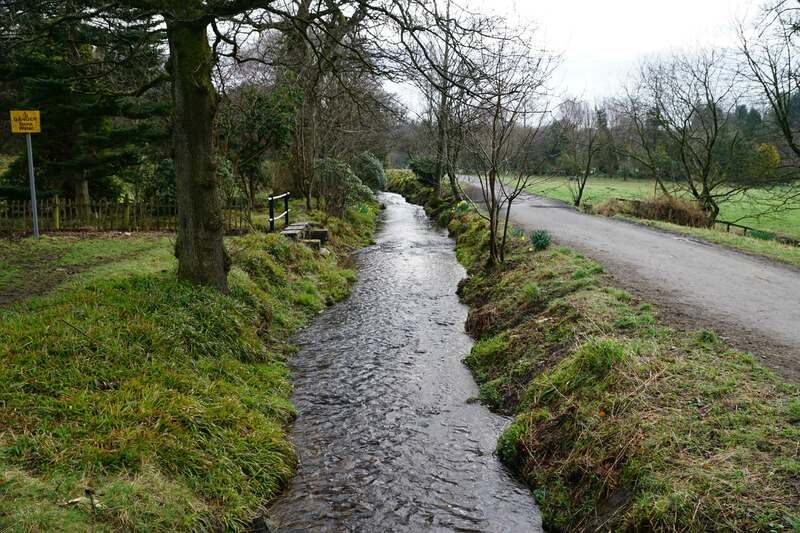 The battlefield has changed beyond all recognition from its seventeenth century form not least due to the creation of the Banton Loch which was flooded in 1773 to serve as the main feeder reservoir for the Forth and Clyde Canal. Both primary and secondary sources are conflicting in their interpretation of the action and therefore it is not clear precisely how much of the battlefield now lies under this water feature. There is a small monument to the battle further to the west and the ruins of Colzium Castle are also nearby. Battlefield Monument. 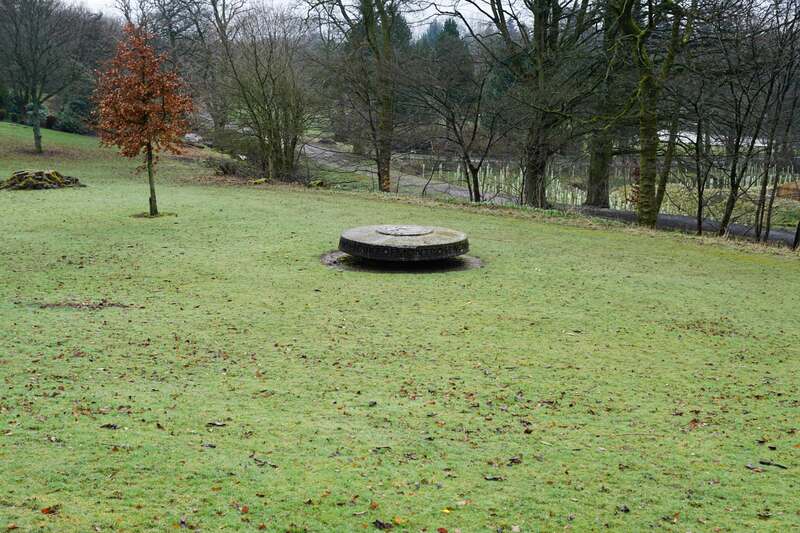 A small monument can be found in the grounds of Colzium Estate just to the south of Colzium House and Castle. The battle was fought further to the east. Terrain. The landscape of the battle has changed significantly since the seventeenth century. In particular Banton Loch, seen left, was created in 1773 to provide a reservoir for the new Forth and Clyde Canal. This probably covered Graham's initial deployment. 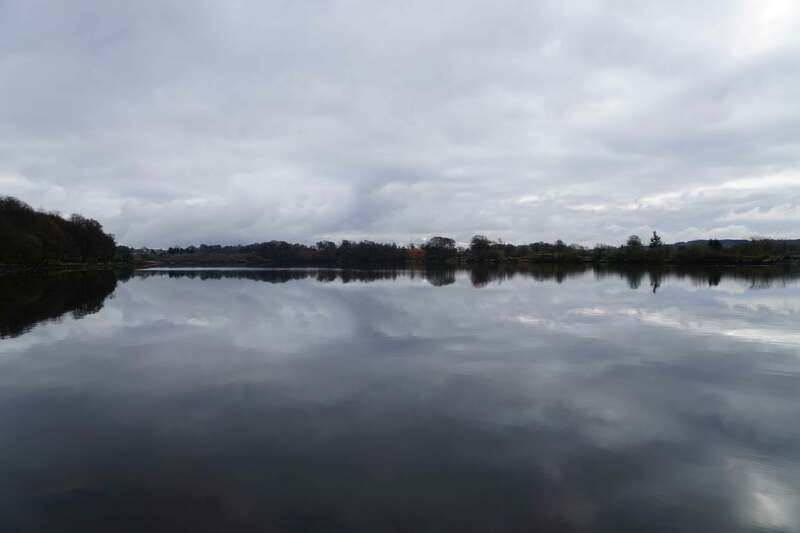 The loch, along with modern drainage, has made the terrain much dryer than during the battle. Re-deployment. 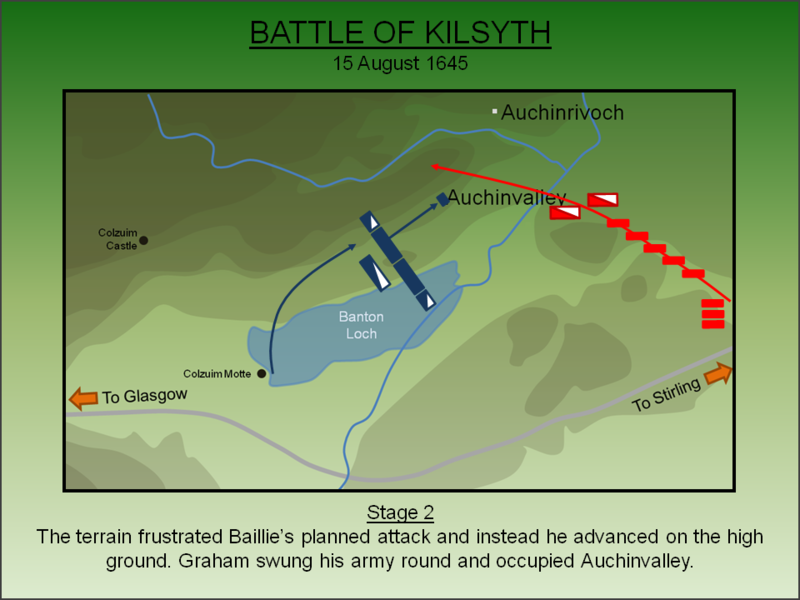 Once aware of Baillie's movements, Graham swung his force around and re-deployed facing the threat. The slight rise seen in the photo above may well have been the new position for the centre or right wings of his army before they advanced on Auchinvalley. Battlefield. The bulk of the fighting probably took place in vicinity of here. The western portion of the Kilsyth battlefield and the monument form part of the Colzium Estate which is found to the north-east of Kilsyth. The site is accessed (and sign-posted) from the A803 Stirling Road. Car parking is available on-site or on-road near the estate entrance. The ruins of Colzium Castle are also found within the estate.